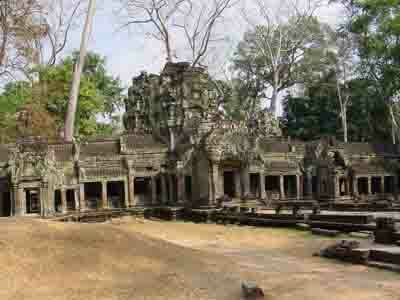 Of similar design to the later Jayavarman VII temples of Preah Khan and Banteay Kdei,this quiet, sprawling monastic complex is only partially cleared of jungle overgrowth. 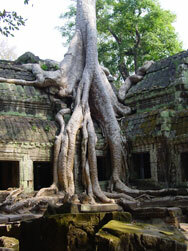 Intentionally left partially unrestored, massive fig and silk-cotton trees grow from the towers and corridors offering some of the best ‘tree-in-temple’ photo opportunities at Angkor. 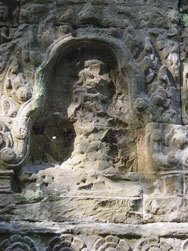 Flocks of noisy parrots flit from tree to tree adding to the jungle atmosphere. 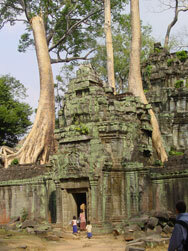 Ta Prohm is well worth an extended exploration of its dark corridors and open plazas. 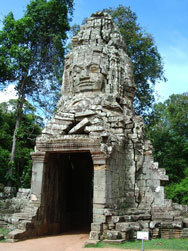 This temple was one of Jayavarman VII's first major temple projects. 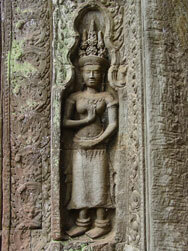 Ta Prohm was dedicated to his mother. 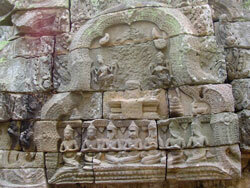 (Preah Khan, built shortly after Ta Prohm in the same general style, was dedicated to Jayavarman VII’s father.) 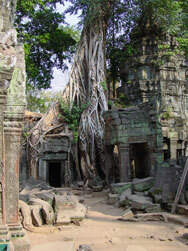 Ta Prohm was originally constructed as a Buddhist monastery and was enormously wealthy in its time, boasting of control over 3000 villages, thousands of support staff and vast stores of jewels and gold. 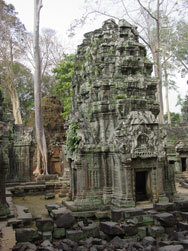 Of the monastic complex style temples, Ta Prohm is a superior example and should be included in almost any temple itinerary.